Pardee Homes has broken ground on Altis, a 55+ community promising a unique and dynamic experience for homebuyers kicking off an exciting new stage of life. Located in the city of Beaumont within California’s Inland Empire, Altis will feature 704 single-story homes priced from the low $300s and designed with the luxurious features and green homebuilding measures that Pardee Homes is known for. A grand opening is planned for the summer of 2018. The heart of this stylish development will be The VuePoint at Altis, a 16,000 square-foot clubhouse with modern design features and impressive amenities. Butterfly roofs will convey a distinctly Californian aesthetic while maximizing the view of the San Gorgonio Mountain from inside the pavilion, which will feature moveable glass walls. The movement studio will also have movable walls to allow open-air fitness classes. 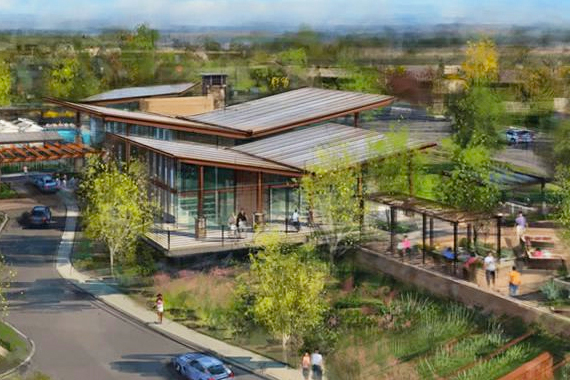 In addition, the clubhouse will include a great room for events and parties, state-of-the-art fitness center, and flexible art and activity rooms with mountain views. Outdoors, nearly 3,000 square feet of covered patios will be available for residents to enjoy. This will include an outdoor space featuring a kitchen, BBQ area, islands with seating and sinks, a fire pit terrace, a 1,200 square-foot butterfly shade structure with an integrated sound system, and a 12,000 square-foot event lawn. A pool area is planned with two pools and a spa. A 2,100 square-foot lap pool will feature integrated therapy with an accessible entry, while a 4,300 square-foot, resort-style pool will offer a beach entry, solar-integrated shade structure, and lounge seating. The elevated spa terrace will overlook the pools with a reflective water feature connecting the spa to the pools. Homeowners will also have access to four pickleball courts and 22 acres of parks. An extensive trail system will connect these outdoor amenities and allow residents to explore the area’s breathtaking natural beauty. Altis will be in a fantastic location with the San Bernardino and San Jacinto mountain ranges just a short drive away for skiing or hiking. Palm Springs and Lake Arrowhead are also nearby. Several golf courses can be found in the area as well, including Moronga Golf Club and Sun Lakes Country Club. In addition, the community’s adventurous residents will never be far from LA/Ontario International Airport. Altis in the Inland Empire is sure to catch the attention of active adults seeking an exciting new adventure. Request more information about Altis.